4 Peaks: The English 3000's. I’m a gluten for punishment. I must be. Generally speaking, most people head out to the hills and maybe tackle a couple of summits at the most in a day. Not me, I’d rather look at the summits and see how many I can string together in a day, how far I can push myself whilst doing them, and then still try and make it harder. The idea of the English 3000s first came to me off the back of looking up the highest UK peaks, and realising I had yet to conquer all the English Mountains over 3000 feet high. I had already done Helvellyn a couple of years ago, Sca Fell, Scafell Pike and Skiddaw were so far unconquered. I had only been to the Lake District once before, and had never been back since. I had definitely underappreciated it even then and didn’t make the most of it. On researching the peaks further, the English 3000s popped up. Having already experienced the Welsh 3000s, I knew it was no easy task, and by all accounts the English 3000s, were meant to be longer and harder, just due to the distance alone. Less mountains, but 40 miles over all. The view of Skiddaw from just below the Blencathra summit. Ideal then, a ridiculous distance and taking in all the peaks I hadn’t yet done, plus Helvellyn again. I noted from some various searches, that a few people had accomplished this with support, supply drops at strategic positions, and company for the journey. It didn’t appear that anyone had done it solo yet, possibly wrong, but sounded like a challenge…challenge accepted. Four peaks over 3000 foot, 40 miles, 24 hours’ time limit, and on my own, carrying all my own gear for 24 hours. I wrangled six days off work, and decided to head up on a Sunday evening to dodge the traffic. Routes mapped, bags packed, car loaded and Keswick bound. I stopped overnight in the luxury of my boot, and arrived just south of Keswick where I set up camp. Monday was spent familiarising myself with the area and the start point, as well as a leg stretch in the way of Blencathra via Sharp Edge. A moderate scramble normally, but a downpour mid ridge made it a bit more difficult. Still a great vantage point of the Mountains beyond Keswick. Tuesday day time was spent resting and eating mostly, as well as kit checking for the trek ahead. The plan was to wild camp that evening atop Skiddaw, then switch my sleeping kit over at the bottom where my car was parked. I love wild camping, I definitely don’t do enough of it. There’s something about it that still gets me excited, it may be some primitive instinct, or just the sense I get that I’m on some sort of adventure, knowing that you’re going beyond the standard day trip, and your skills, knowledge and equipment will make the difference between a pleasurable stay or an absolute nightmare (I’ve experienced the nightmare aspect). Wild camping on a mountain top though, that’s something else. Waking up with some of the most breath taking views around definitely makes waking up at the early hours’ worth while. The exposure up there is something else too, no trees to hide behind, just hunker down and let your kit do its job. 0400 my alarm went off. 0430 I remembered that I had snoozed said alarm, and needed to get up to beat the sunset. Albeit, I timed it to perfection, and caught the sun rising just in front of Blencathra. I could have easily sat there and watched it for another hour, but scoffed some breakfast and quickly packed up, eagerly making tracks down from Skiddaw to the Forestry Car Park at the base. After a hasty gear change, I ploughed on. 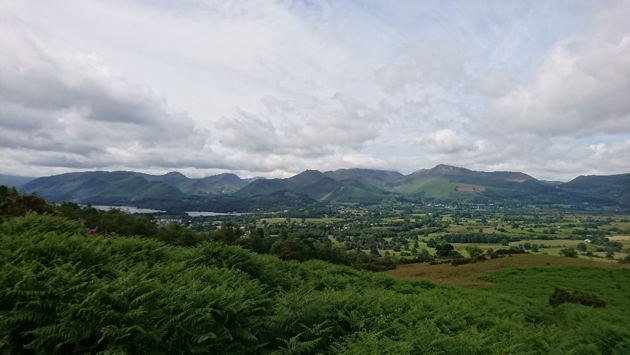 The first leg was getting through Keswick, and out onto the road, following Derwent Water to one of its tributaries, River Derwent to the south. Most of the walk was following the road, with the occasional public footpath leading alongside. At this point I was in mission mode, and just kept my head down and motored on. 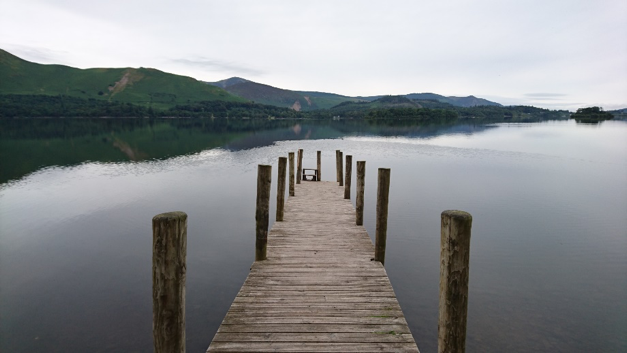 I made one stop at Derwent Water for the obligatory photo of a Jetty protruding into the Lake, and the hills surrounding. It was definitely a welcome break. Luckily the weather was cloudy, and not too hot, but my rucksack was certainly heavier than expected. Even with cutting back on some kit ‘d usually take with me Id decided they were more luxury than essentials, it was still plenty weighty enough. The amount of food I had taken was the biggest load, and at least 3 litres of water, knowing that this would be refillable in the rivers on the way. Without being too scientific, I knew I would burn a lot of calories, and roughly worked it out from previous trips, and then allowed for just over this to keep me going. Exhaustion would probably be the biggest barrier, and by keeping fuelled, I could hopefully negate this as much as possible, or at least postpone it. Heading Down the Keswick from Skiddaw. The first section flew by, the 14 miles to Seathwaite was achieved with relative ease, I think I had become accustomed to the weight of my rucksack. I still felt really fresh, and had stopped occasionally for some snacks and fluids as I went. I reached the track up to the north of the Scafell range about 1100, with the view of taking the corridor route to Scafell Pike itself. I stopped at about 1200 for dinner, just below the path to the corridor route. After stuffing myself with food, mainly to lighten the rucksacks weight, I carried on descending down the path and then sharply up the corridor. I imagine the views would be amazing, unfortunately I’d timed it to perfection and started the ascent just as the cloud descended on the summits, managing only to catch fleeting glances of the cliffs peering out from the clouds, ominously reminding me of how far I still needed to clamber. It was an interesting route, it frequently switched between worn paths and jagged rocks that I had to pick my way across. I’d ditched the walking poles I had been using religiously to help with the load, and got hands on with some parts to lower myself down without toppling over due to being somewhat loaded up. Before getting half way along the Corridor, I had already decided not to take Lords Rake route. That route was a decent scramble along the cliffs of Scafell, and energy conservation was a priority despite the thrill seeking element in me. Jetty out on to Derwent Water. 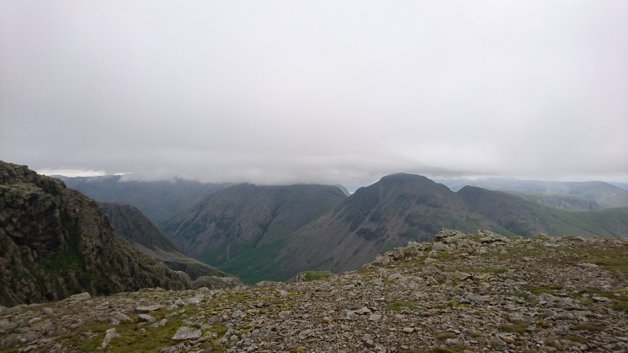 I went directly to Scafell Pike, and after a quick breather, and directing some lost walkers back down the mountain, I ditched my rucksack and switched to my approach shoes to leg it across to Sca Fell. What a relief it was to get that weight off. My approach shoes felt like slippers after wearing my boots for miles. 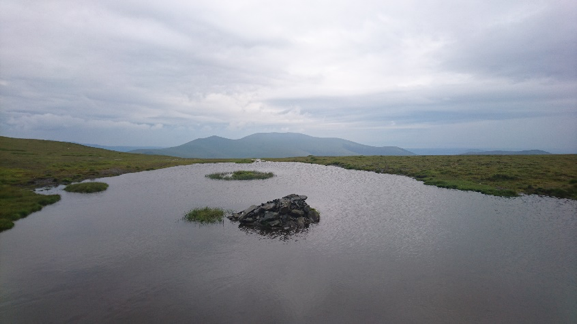 Rightly or wrongly, I found my route up Sca Fell to resemble a small waterfall, and skirting around it, I made quick work of ascending to the deserted summit. I quickly tagged it, and headed straight back to my kit. Despite the lingering cloud, and now drizzle, Sca Fell Pike was quite busy with undeterred walkers, and on being reunited with my kit, and a quick change, I headed down Scafell Pike aiming for the small hamlet of Wythburn, just to the West of Helvellyn. As I descended, I was joined by another walker who was quite perplexed as to why anyone would summit two mountains in a day, let alone anymore, and then walk the distance required between them all. Probably a fair point. I couldn’t really offer much of an explanation as to why anyone would either. We parted ways just after I had made fleeting visits to Broad Crag and Ill Crag, just in case they counted, and they were too close to my route to miss. I carried on across the undulating terrain, and glanced back just in time to see Scafell Pikes summit emerging from the cloud as I dropped down into the Valley below. Inevitably the terrain soon took me higher again, and I found myself on Mansey Pike, however this time the tracks had become paths, and steps. That amount of steps after walking about 30 miles is never fun. I place the credit on my walking poles for getting me up them with little complaint from my legs. They had started to burn a bit after jaunting in-between Sca Fell and Scafell Pike, but that had long since passed. I wasn’t even too worried when I got to the other side of Mansey Pike and then lost the height I had gained, knowing at some point I would have to reclaim those metres again. I could see a rather large hill in the distance, and for some reason had in my head that my route would in fact take me past, or around it. Oh was I wrong. Staring down at me was High Raise, a mere 2500 feet. I will never forget that hill. Looking up at it from where I was, knowing I had to descend again to get passed it. Despite eating most of my food, and having at least half my pack weight left, my rucksack started to feel heavier than it had all day. The burning in my calves made a sudden resurgence, and I hadn’t even started ascending it yet. I convinced myself that I was just hitting the psychological “wall” and would just need to push through it to get the job done. So I did. Despite being less of a gradient, easier terrain, and less height, this was the hardest ascent of my day. I had energy gels with me that I had started to crack out, but they seemed to do nothing. I felt constantly thirsty despite constantly drinking to negate it. It was as if it the water just wasn’t going in. I dug in as much as I could, using my walking poles to haul me up the side of the Fell, almost shuffling my feet along just to keep moving. I looked to offset the climb as much as possible by taking it at a diagonal, before contouring around just below the top to join up with a path that would lead me to my exit and into Wythburn. I was really digging deep, and it was as if all my fatigue from the entire journey hit me at once. I'd managed to pull myself around it, and I’m not sure if my body sensed the relief, or just exhaustion caught up, but as soon as I found the path and my walk levelled out again, my legs just gave out. I flopped down rucksack first onto my back and just lay there. Sensing that I could well be getting myself in to trouble, I hastily checked my phone in case I couldn’t walk out, only to find no signal on any network, meaning any emergency call was essentially useless. In my head I had already told myself there was no way I would call for help to get out, but it would have been a reassuring thought had I no other choice, and even considering it was a first for me. Not a chance, I’d got here, I’d get back, and I was still going to bag Helvellyn on the way. I righted myself, and with a sudden purpose and renewed vigour from, who knows were, I carried on towards my final summit. The View from Broad Craig. I had before my last trip to Scotland bought myself an all singing and dancing GPS watch, mainly to track my routes, distances, altitude, calories etc. One thing I’d forgotten I even had was a built in storm alarm. Cue storm alarm. By now it was nearing 2130 and was getting dark anyway, so I hadn’t noticed any weather conditions changing, and there still seemed nothing imminent. Having never had the alarm work before, I wasn’t sure on its accuracy. That was shortly proved to be pretty accurate. A matter of minutes later I was throwing on any waterproof kit I had as it began pouring down. I continued trudging on and could see lights in the Hamlet I was aiming for at the end of the valley. I dragged myself through the rain which just got heavier and heavier. By now I was shattered. I started making silly mistakes in navigating, to the point I was missing marked paths, even with a head torch, and my footing was all over the place on a very rocky track that was now worsened by the conditions. I finally found my way out onto the main road, and the final turning to ascend Helvellyn. The rain was now hitting me from two directions, bombing straight down on top of me, and bouncing back up from the road. Despite my determination, the realisation that even after climbing Helvellyn I still had 6 miles back to my tent, and the fact that the conditions on the flat were horrendously dangerous, led to the impossible decision not to ascend Helvellyn. In hindsight, that was the correct call. The 6 miles back was long and arduous. The rain was still hounding down, and I’d decided that it was worth finding a phone box in one of the villages along the road to try and call a taxi at the least. Not being a defeatist, but by now my feet were numb from being on them for so long, and my legs had started to seize up. Id realised I hadn’t actually stopped since High Raise, and had forgotten to eat. It seemed sensible to get back safely as soon as possible. Usually I’m pretty fit, and would not have had a problem. I can only attribute the pack weight and conditions to my decline. It certainly hadn’t helped. Unfortunately, the only phone box I found served only as a temporary shelter, the phone itself being out of use. Damn. Onwards. I slogged it back to camp, and made it back in more of a shuffling action rather than a walk. At about 0130 I clambered into my tent. Despite being shattered, I felt accomplished. 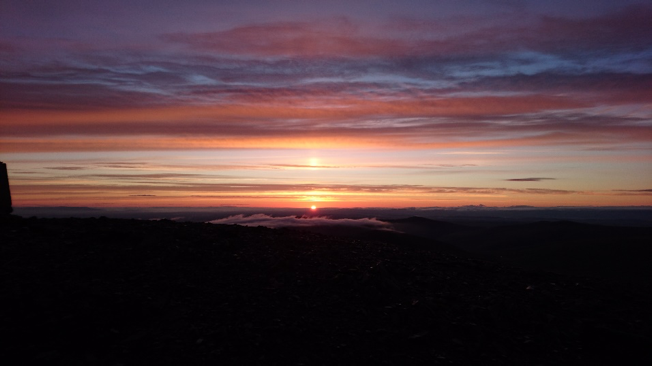 I may not have made the final summit, but the distance I had covered on foot, the mountains I had ascended, and the night on Skiddaw, well…that was an achievement and an experience. If you can take all of that away with you, then surely that’s an accomplishment in itself. Start of my journey sunrise from Skiddaw. Ben James. Explorer - Fuelled By Tribe.